“Hi we have a project covering the end of the Space Shuttle Program and wanted to do 3D images for part of it. Problem is to get the spacing between the cameras correct to give the proper 3D affect and not give the viewer a headache. 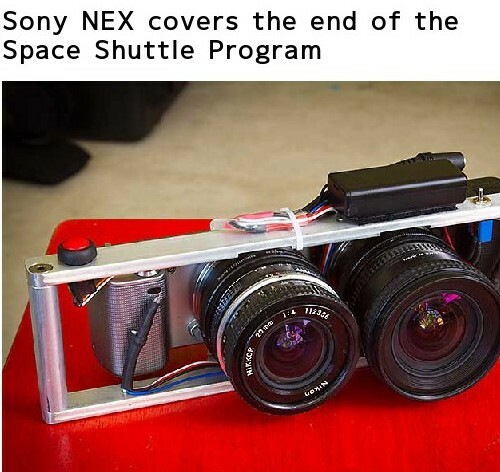 Plus even though Sony has a 3D effect built into the camera but it does not capture 2 images at the same moment in time one photo is taken then the camera moves and another photo is taken. Best solution we found for great quality and speed is 2 Sony NEX-5′s. One camera is inverted and we are using 2 Nikon 20mm lenses with Nikon to Sony E adapters. The cameras are fired though IR Bob Fisher the projects “Widget Guy” created the circut and the San Diego Air & Space museum restoration shop machined the bracket. Bob then put it all together. The small size and weight make working with two NEX-5 a breeze and no shutter lag.